We all want to look exquisite on our wedding day. Often we get so excited about the dress, after all, we have dreamed about it since we knew what a wedding was, that we do not take into consideration some simple facts of where we are getting married. On more occasions than you may think, brides have made decisions on their wedding attire that ended up affecting the happiness of their eventful day. Here we will address (haha) some details you may want to think about if you are getting married in a tropical environment like the Caribbean. Once you know that you are getting married in the Caribbean or a similar island destination such as Cozumel or Isla Mujeres, think elegance with a bit of a casual touch. Remember the details of the location: sand, breeze, heat, humidity. Think of how you move in the sand. These reminders will help you dictate the design of the dress as well as the fabric. Let’s talk fabric. It’s hot and humid in places in the Caribbean such as Playa del Carmen or Tulum, Mexico. You will want something light that breathes such as linen or organza. Although silk can be light, it stains. So remember salt water, especially if you are going to take photos in or near the water, can permanently stain silk. Also, be prepared to glow a bit! You do not want sweat stains on your silk dress. Linen is light and it breathes well. You also want fabrics that flow easily in the breeze. You can’t fight the breeze so you might as well factor it in from the beginning. Other fabrics to consider are chiffon, superfine jersey, batiste cotton (manta), and tulle. You also want to consider fabrics that do no wrinkle easily as you will be traveling with them. The pattern is very important. It isn’t always easy to walk through the sand. It’s not even and sometimes it’s not sturdy. You may want to opt to walk down the sandy aisle in bare feet. Aside from footwear, think of comfort. Walking wise you will want something that is not constricting such as a column or pencil skirt. Let it flow. Allow your steps to be free and the air to move under the dress as well. Anything tight will be hot. You will most likely want a strapless or halter type dress so that your arms can move and air can get to those delicate underarms. Also, will you want photos in or near the water? You may want a shorter dress to avoid it getting wet and heavy. Embellishments, we all want those. Beading is beautiful but too much can feel heavy and in the hot weather will fell 3 times heavier. Embroidery is a good choice because not only will it look beautiful, it travels well because it will help hide wrinkles from being packed. Ruffles will also look flowy on the beach in the breeze. Trains are to be considered but try to remember you will be dragging it through the sand which will be taken inside to the reception. Also if you are familiar with Caribbean sand, it is fine and will be there when you unpack to get home. If you opt for a train, keep it short. As for veils, keep them simple or forget about them. They will need to be short but remember tropical breezes can pick up speed and that veil might end up fluttering all over your newly made up face. Blushing veils, over the face, will just end up being stuck to you and making you feel suffocated. You can very easily put a decorative comb in your hair which will help you keep your hair out of your face as well. 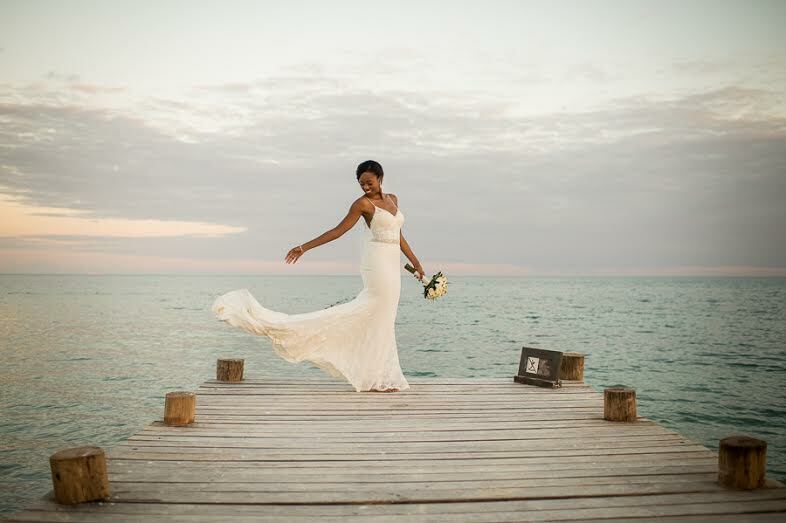 If you are planning a destination wedding in the Riviera Maya, check out the work of Doranna De Bortoli who has worked with over 3000 of the happiest brides. 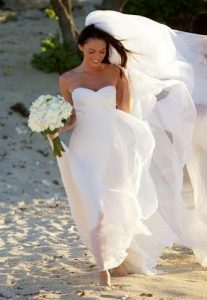 Check out her website to see her gallery of partial and full updos which are great for tropical weddings.